Attempting to discuss Set can be a tricky endeavor. Like all deities, he has had a long and varied existence, and those darn Egyptians were so fond of writing about their gods that the stories are long and the inferences are many. So, bear with me as I take a stab at talking about Set. It appears that originally Set was a desert god, and thus all desert things were under his purview. Some examples are sandstorms, desert caravans, and the animals that lived near the edges of the desert like donkeys and gazelles. Set was a very important and powerful god. You would have to be if you held court over such a hostile environment. Set was a chief god and his influence was strongest in Lower Egypt. 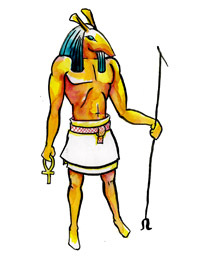 Just as Set was the big deific cheese for Lower Egypt, Horus laid claim on Upper Egypt. When the two lands became united the pair worked together crowning pharaohs and such. Of course, since technically Upper Egypt had defeated Lower Egypt Set was viewed as the bad guy counterpart to Horus’ supreme coolness. Despite the fact that Set gouged out Horus’ eye in their conflict, Set was still an all right god in most Egyptian’s books. Then the fit really hit the shan for the poor guy. These pesky foreigners, the Hyksos, had to go and gain rulership of Egypt. Worse, Set reminded the Hyksos of their warrior god and so they raised Set up to be the primary god of Egypt. Sure, it sounds like a good gig, but you know, the Egyptians were obviously not the biggest fans of the Hyksos. Since Set was already the lesser bad boy god to their beloved Horus, guess who got to eat all the seething burning foreigner hatred? That’s right, our boy Set. Set grew to embody all that the Egyptians hated about the Hyksos, and thus began to be perceived as an even darker and more evil deity than before. Soon all the identities of other evil deities began to be absorbed into Set’s identity. Gradually no one even remembered desert Set. You know, the guy who controlled the sands? Friend to donkey and gazelle everywhere? Now Set was associated with animals the Egyptians feared, like crocodiles and hippopotami. Also, Set became related to evil deities of other rising empires. These days when you look for a basic definition of Set you generally hear these words: chaos, war, storms, inhospitable places, Satan, black magic, Left-Hand Path, and other unsavory persons, places, and things. Granted, Set was never the God of Puppies and Rainbows, but still, it’s a dark place to land for any deity. If darker things float your boat, you’ll be happy to know that there is in fact an active organization devoted to the worship of the Set from the end of the story. Me, I’m looking for the ones that likes the Set from the beginning. I’ve got my sunscreen and flask of water waiting for when they call.